Growing up in Alabama in the thick of the Civil Rights movement, when segregated facilities were still common, Dr. Johnson’s innate love for inventing guided him past the sizeable obstacles in his path to becoming an engineer, inventor, and successful entrepreneur. He cannot remember a time before he was interested in making and deciphering things; today he holds 80 patents and has 20 pending on products ranging from toys to advanced technology solutions, and his companies—Johnson Research and Development, Excellatron Solid State, and Johnson Electro-Mechanical Systems—hold additional patents. He also devotes much of his time to outreach aimed at attracting under represented students to STEM fields—a project he says is crucial to maintaining the United States’ position as a technology powerhouse. Dr. Johnson spoke with Innovator Insights™ about his past success, his current projects, and how he is helping to shape the future of STEM. What got you interested in inventing? I think I evolved into it over time. As far back as I can remember, I’ve been interested in the mechanics of things. I was always inventing and making something. When I decided to go to college, I had to choose a major, and I had wanted to be an engineer before I even knew what the word “engineer” was, so it was a natural progression. What kinds of things were you making when you were young? 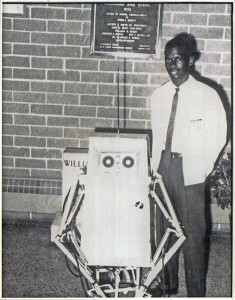 Lonnie Johnson with his robot, Linex, in 1968. By the time I got to high school my inventions had become pretty sophisticated. I actually built a robot in 1968—it was a fully remote control, programmable robot that used pneumatic actuators, solenoids, and decoding systems. It took me about a year to complete him. He was fairly complex. He’s my alter ego—I named him Linex, after myself (see picture, right). How did you get the idea to build a robot? I used to watch robots on TV as a kid, and I just wanted my own. They didn’t tell me that the ones on TV had people inside. In my senior year of high school, I entered Linex into the science fair, which was held at the University of Alabama. He won first place and was on all the local stations in Mobile, Alabama. This was in the heart of the civil rights movement and the same year that Martin Luther King, Jr. was assassinated. I called it the Digital Distance Measuring Instrument—I got the patent in 1979. It read binary coded information from a scale that was photographically reduced. It was the base technology for CDs and DVDs, but I never commercialized it. I refer to it as the big fish that got away, but I was patenting for fun back then. I was in the Air Force at the time and working on outer planetary space craft, including Galileo, and really enjoying my day job. I did think that was a really intriguing invention and that once I got the patent, the world would beat a path to my door, but it didn’t work out that way. How did you move from inventions like that to making toys? If you want to come out with a better mousetrap, you’re not going to get any investors unless you have some way of controlling your destiny. The patent system provides that for you. I had been doing high tech stuff and not getting any interested investors—a lot of people didn’t really understand the inventions or the technology. I just couldn’t get people interested in the more challenging stuff, so I decided to develop something straightforward, and a toy fit the bill. My first invention that went to market was a toy water-propelled airplane called Jammin’ Jet. That was in 1987. With that, I was able to go out on my own as a full-time inventor. What inspired the Super Soaker®? The idea for the Super Soaker® preceded the airplane, but the airplane was the one that made it to market first. I was working on another project at the time—a refrigeration system that used water as a working fluid—and I shot a stream of water across the bathroom using a nozzle-like machine I had hooked up to the bathroom sink. It was a small stream of water, but very powerful, and I thought, “high-performance water guns would really be neat.” So I put the more scientific project aside and decided to work on that. What was that experience like—did you learn a lot from having such success? It took about seven years from the time I got the idea to the point where I met the people at Larami Corp., the company that ultimately commercialized the Super Soaker®, and about 10 years until it became the number one selling toy in the world, in 1992. I had a number of false starts. At one point, I was trying to manufacture the product myself. One company I was working with went out of business. It soon became very clear to me that there was a lot more to understand about launching a company than I had realized. As a Captain in the military at the time, being an entrepreneur was not in my portfolio of experience. I figured there were people out there who made toys for a living and that I could learn a lot from them, so I decided to go the licensing route. I found Larami at the toy fair in New York City in 1989—it was a small toy company, but they were very interested in the innovative and high-performance features of the water gun and had engineers on staff that I could work with. They were very successful in getting the gun designed for commercialization. I got a number of rejections before that, including from Hasbro, Inc., which ultimately bought Larami based on the success of the Super Soaker®. What was your initial experiences with patents like? For my first patent, I actually went to the library and looked up patents and drafted it myself. Before I submitted it, I showed it to a patent attorney and he said it needed a lot of work and offered to fix it, but I wanted to learn. He explained to me what was wrong and I went back and rewrote it and through that iterative process I learned how to write patents myself. These days, of course, I have outside patent attorneys. Now we’re filing international applications as well as domestic and it’s a very challenging process. As a small company, I find it a bit overwhelming, especially with the first-to-file requirement. I prefer the old [first-to-invent] system. There is often criticism of the patent system more generally as well–how important are patents for an inventor and entrepreneur like yourself? We can’t maintain technology leadership in the world when we’re leaving large segments of our population on the sidelines. For a small company or innovator, the patent system is crucial. If you want to come out with a better mousetrap, you’re not going to get any investors unless you have some way of controlling your destiny. The patent system provides that for you. There’s no reason for a large company to do business with you if you don’t have some way of enforcing your rights. The system is crucial for small inventors, but the way its set up now—between the expenses and the first-to-file rule—puts the small company at a disadvantage. You have over 100 issued and pending patents today—is there one you’re most proud of? The “JTEC” [the Johnson Thermo-Electrochemical Converter, for which Dr. Johnson won Popular Mechanics’ 2008 Breakthrough Award] is one I consider to be very special. It’s a heat engine—as an inventor, inventing an engine is really cool. The JTEC converts heat directly into electricity. The last equivalent engine was the Stirling engine, which was invented around 1850, so this is a significant accomplishment. It’s been a challenge to get developed though, and we’ve had it on hold for a while because we’ve been working on a new battery technology, which is another area where we’ve done a lot of hard work and made very good progress. You’re involved with a number of diversity initiatives aimed at getting under represented students involved in STEM fields—what kinds of things are you doing? We do a lot of outreach to get kids interested in tech and STEM areas, particularly using robotics as a tool. We’re involved with the Georgia FIRST Robotics program. I’m on the Board of Directors for Georgia FIRST, and we’ve set up the Johnson Stem Activity Center (JSAC), our own 501c(3) nonprofit here for activities we do on site. We have a little over 100 kids in and out on a routine basis. We also do demonstrations at other facilities, schools, and recreation centers to get kids interested in technology. We work with the 100 Black Men of Atlanta to mentor kids in robotics. The Fernbank Science Center is the city’s major science museum and their robotics team trains out of our facility here. We have a team that includes foster kids and international students, including refugees, who speak 13 different languages. It’s a very diverse community. When you look at large corporations, the minority representation is only 10% or so, but minorities are 30% of the population—soon to be 40%. We can’t maintain technology leadership in the world when we’re leaving large segments of our population on the sidelines. We need all hands on deck. That’s something I emphasize to people every opportunity I get. What advice do you have for aspiring inventors and entrepreneurs? Perseverance is what I would stress for anyone interested in achieving anything significant. That includes learning the things you need to learn in order to overcome the obstacles that you face. It takes a lot of determination; you can’t give up when things get hard.